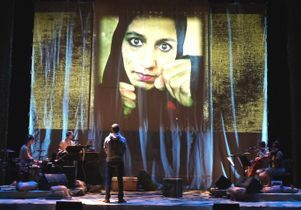 Theater production ‘Basetrack Live’ and interactive installation ‘Peace & Quiet’ open this week. Tyler LaMarr stars in "Basetrack Live," Friday, Oct. 10, at 8 p.m. in Royce Hall. 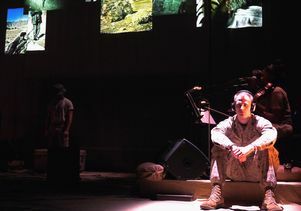 In conjunction with its performance, the Center for the Art of Performance at UCLA has opened "Peace & Quiet," an installation aimed at building bridges between military veterans and civilians. Tyler LaMarr is a Marine, one of the 2.6 million Americans who have been deployed in Iraq and Afghanistan over the last decade. A veteran of what has become America’s longest war, LaMarr is also an actor in a group of artists who are bringing the stories of his fellow American servicemen and women and their families to light through the lens of theater with a piece called, “Basetrack Live,” which is coming to Royce Hall Friday, Oct.10, at 8 p.m.
“Basetrack” is a unique multimedia theatrical experience that’s derived from a wildly popular Facebook page and website that feature photographs and videos taken in Afghanistan by embedded journalist Teru Kuwayama and his colleagues. 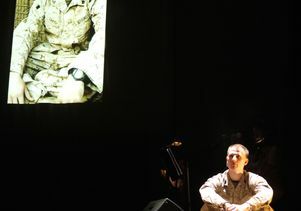 The main narrative of the piece, performed by LaMarr and actress Ashley Bloom, is based on the true story of a married couple and their deployment experiences. 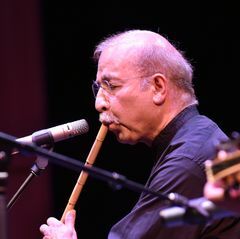 Video footage, photos and stories from other veterans and their loved ones accompany the story — all set to live music. To give students, staff, faculty and campus visitors a chance to connect with veterans, listen to their stories, shake their hands, leave them notes and read their letters from the front, the Center for the Art of Performance at UCLA (CAP UCLA) is also presenting a weeklong interactive art installation that’s currently set up on Royce Quad until Oct. 10. 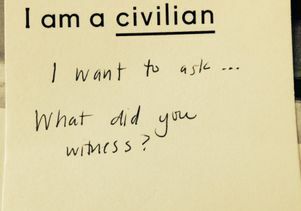 Creators of the installation want to build dialogue and mutual understanding between veterans and civilians. The installation, “Peace & Quiet,” is being presented in collaboration with the UCLA Chancellor’s Veterans Initiative, the UCLA Veterans Resource Center, UCLA Communications and Public Outreach, and Brooklyn-based Matter Architecture Practice, the group that conceptualized and developed the temporary installation. Visitors to the installation can see a gallery of wartime letters and photos from conflicts over the last century. 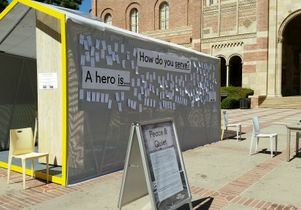 Visitors to the small house set up on the quad will find a Conversation Wall with a different daily prompt comprised of questions that will inspire them to start a conversation with a stranger, share a memory or question, or write something that they think will inspire others. In addition, there's letter-writing hosted by UCLA’s Operation Gratitude to thank U.S. active service members deployed in hostile regions as well as veterans and first responders. A children’s book drive is being held in conjunction with Blue Star Families. And “Stories of Service,” a recording/listening station, enables community members to record their own stories as well as listen to others' personal stories. 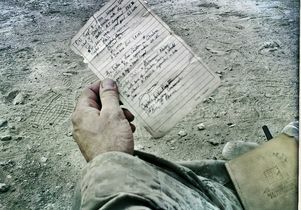 A gallery of photos and letters documents America’s wars through the last century. 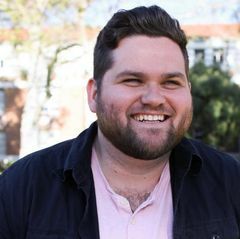 For a more personal viewpoint on war, there will also be opportunities to have informal conversations with UCLA veterans and service providers. Information on the many programs and services that UCLA offers its military and veteran community is also available. Created by Sandra Wheeler and Alfred Zollinger, co-directors of Matter Architecture Practice, the UCLA installation of this work is its second iteration. The first installation of “Peace & Quiet” was held Nov. 11-16, 2012, in New York’s Times Square. Wheeler said they are eager to see how the project will translate to a new physical space. “This setting of being in the middle of a population of students, who are in the mind frame to having their minds open to new ideas, thinking about things and discussing things, creates a real opportunity,” she said. “Basetrack Live” is as much about advocacy as it is about performance, LaMarr said. 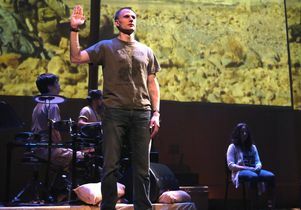 While it’s a theatrical work, he said, “it also helps illuminate and articulate the unique experience of veterans from Afghanistan and Iraq — men and women who volunteered to serve and were able, through modern technology to stay in touch with family and loved ones even while deployed. Being involved in the arts has been therapeutic in helping him cope with his wartime experiences, said LaMarr, who returned to college to study theater after leaving the service. 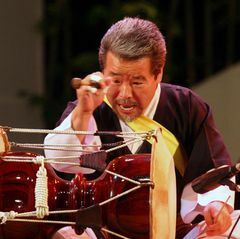 He is also the co-founder of Society of Artistic Veterans, a nonprofit organization dedicated to providing education and opportunities for military veterans who are pursuing careers in the arts. 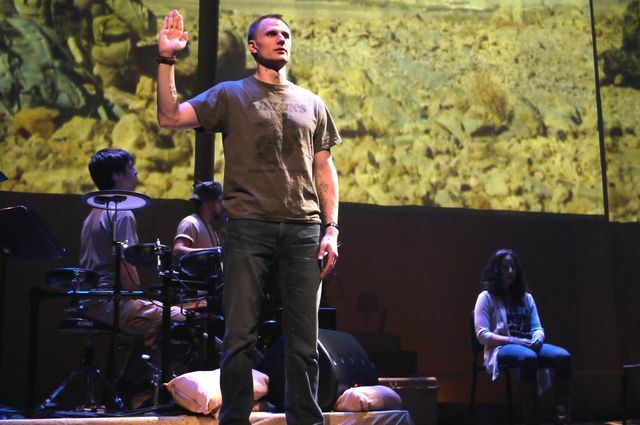 “Basetrack Live,” which premiered in Austin, has been evolving as the result of dialogues between the cast and crew and their audiences, veterans and civilians alike. LaMarr said the response to the work so far has been incredibly positive. Fellow veterans who have seen it have been appreciative and supportive of the work and its larger aspirations to bring vets and civilians together. UCLA is already home to a wealth of initiatives for veterans, from programs that help student veterans navigate the benefits process to efforts to bring injured vets and their families to UCLA’s medical facilities through the nationally acclaimed Operation Mend. The installation will be staffed from 10 a.m. to 2 p.m. through Thursday, and from 10 a.m. to 10 p.m. on Friday. Tyler LeMarr stars in "Basetrack Live," Friday October 10 at 8 p.m. in Royce Hall. 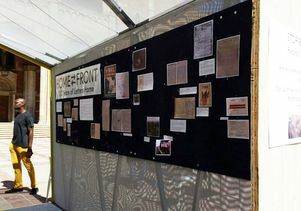 A display of letters and photos from conflicts over the last 100 years is shown. The installation will be up until Oct. 10.